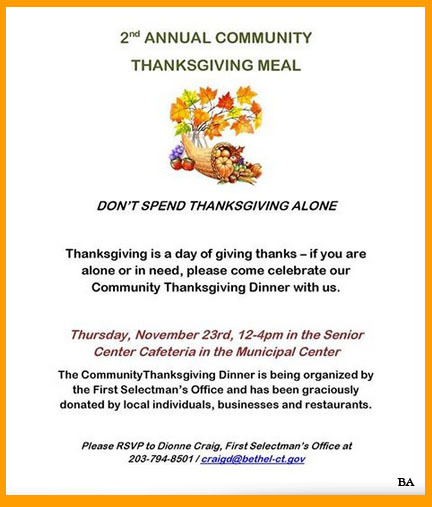 Thanksgiving is a day of giving thanks — if you are alone or in need, please come celebrate our Community Thanksgiving Dinner with us. The event will be held on Thursday, November 23rd, 12-4 p.m., in the Senior Center Cafeteria at the CJH Municipal Center, 1 School Street, Bethel, CT. 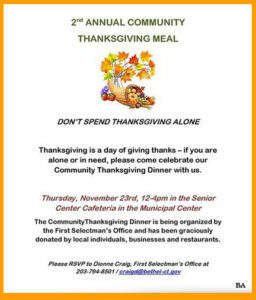 The Community Thanksgiving Dinner is being organized by the First Selectman’s office and has been graciously donated by local individuals, businesses and restaurants.